He graduated from the School of Fine Arts in Athens (1899) and continued his education in Antwerp. In 1901 he moved to Smyrna, fromwhere he left when the Greek army was defeated in Asia Minor in 1922. Living in a cave on Mount Olympus for some 20 years, from 1928, heapplied himself to painting, capturing facets of the mountain landscape. He later travelled to various regions in Greece. 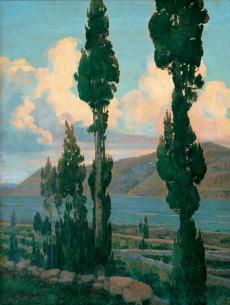 The most representativeaspect of his work, landscape painting, is characterised by his commitment to draughtsmanship.